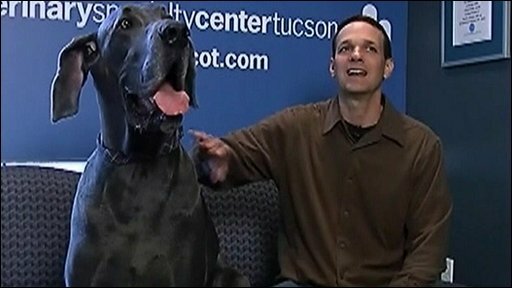 A Great Dane from the US state of Arizona has been officially recognised by Guinness World Records as the tallest dog ever on record. Giant George, owned by David Nasser, stands 43in (1.09m) tall paw to shoulder, and weighs 245lb (111kg). Guinness officials say there were conflicting reports about Giant George's height, so they sent a judge to his home in Tucson to verify it. Giant George - who has his own website - consumes 110lb of food each month. Four-year-old Giant George made it into the record books by beating his nearest rival, Titan, a Great Dane from California, by three-quarters of an inch. He was named by Guinness World Records as both the world's Tallest Living Dog and Tallest Dog Ever. Mr Nasser says George sleeps on his own queen-sized bed inside the house. On a recent plane trip for a media appearance in Chicago, George was given a row of three seats to himself. And his presence on the plane certainly caused a commotion, says Mr Nasser, with many passengers coming up to take photographs. "There were so many people coming to the front of the plane, the pilot ended up illuminating the 'fasten seat-belt' sign to get everyone to sit down," he added.